Easily find events on the days when you wish to fly. Events are also sent to you via the Helipaddy monthly newsletter and they are also available in App. Pilots can now edit their private sites from the online dashboard, making it easier to keep your personal sites updated. 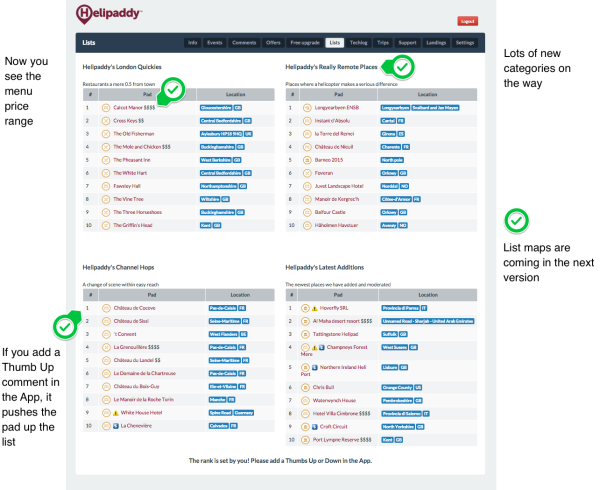 Read on for further details on adding personal sites and your pilot dashboard. All landing sites in Helipaddy require prior permission (“PPR”) before you can land, no different from airfields and actually much more important. We are now categorising the ones that require only short notice. Read on.. Your route from your current position is plotted in Skydemon and the waypoint is labelled! This is not automated nor approved by Skydemon but it an effective workaround for those that tend to use the iPhone, iPad or Android for navigation. Favourite a few sites in Helipaddy (view the site in the App by clicking on its label and click the star) or add a few private sites. 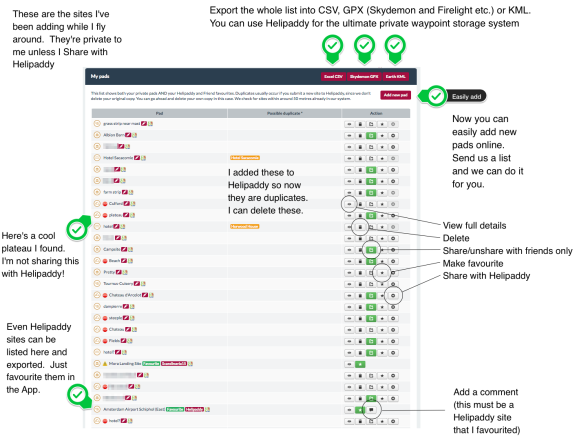 Scroll down to My Pads and click the Skydemon GPX button - this will save my_pads.gpx to your Downloads folder. Your Helipaddy pads are now visible on all your Skydemon devices! 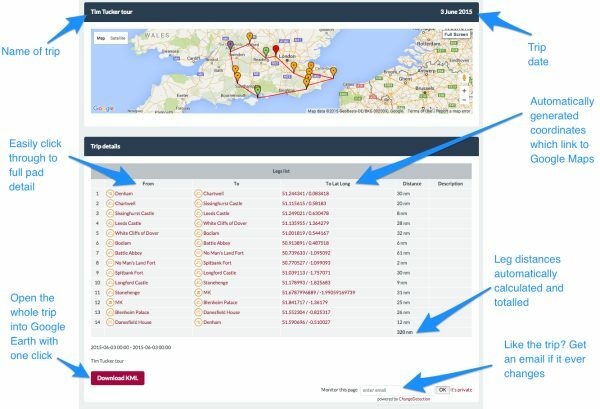 Keep an eye on this space - soon you will be able to view your Helipaddy Trips as routes in Skydemon! This is not automated nor approved by Google but is an effective method. Scroll down to My Pads and click the Earth KML button - this will save my_pads.kml to your Downloads folder. 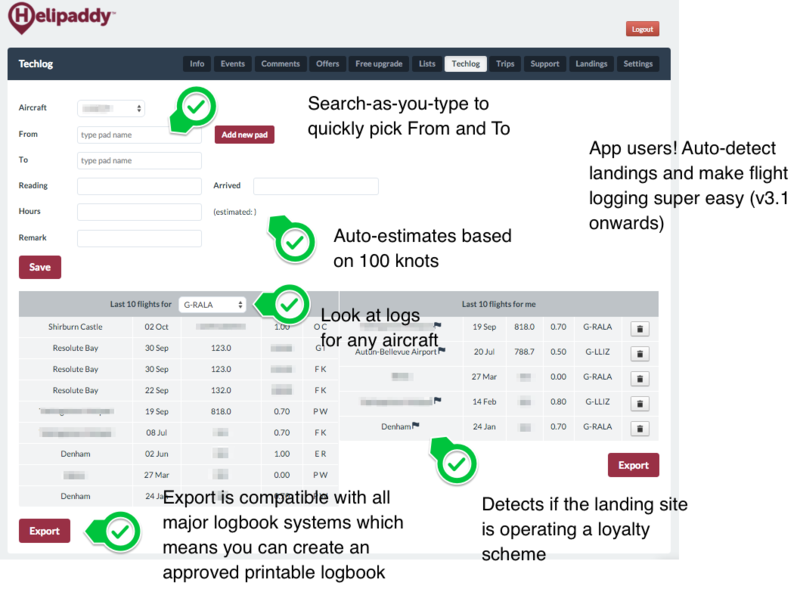 We’ve made a few improvements to the list of landing sites, helipads and points of interest in your online dashboard. You get some cool features, too. For example, add a marker anywhere in the map and see up to 10 places to eat within walking distance. Neat! We have done a bit of work on our tagged list pages for Premium pilots! Check out the new lists in this article and log on to your dashboard to explore them.